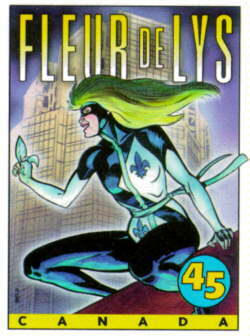 Fleur de Lys made her debut in 1984 in the third issue of New Triumph. According to the story line, martial arts expert Manon Deschamps assumed the costumed identity of Fleur de Lys, operating in real Montreal area locations, and joined forces with Northguard, New Triumph's featured hero. Although not the product of a world war, she, too, served to protect Canada--this time from a threatened takeover by a tight-wing evangelical group and from organized crime. Her Catwoman-like super hero costume is blue and white and emblazoned with one French canadian fleur-de-lys on her forehead and two more on her body. She carries a nonlethal weapon shaped like a fleur-de-lys that protects her by producing bright flashes of light. Montreal writer Mark Shainblum created the script and Montreal artist Gabriel Morrissette did the artwork. After an eight-part adventure series, financial difficulties forced the end of Fleur de Lys and Northguard in 1990.